Basani Maluleke, CEO of African Bank. • As leaders in the Fourth Industrial Revolution addressing inequalities and inclusion, how do you create global shared value? • What do you see as the new wealth creators of the future? • How would you diversify into these sectors, and how has the definition of the words ‘wealth’ and ‘value’ themselves changed over the years? In July 2017, Nozipho Sithole took on the role as the first-ever female CEO at Transnet Port Terminals (TPT) – South Africa’s leading terminal operator responsible for loading and offloading cargo aboard vessels calling into seven national ports. 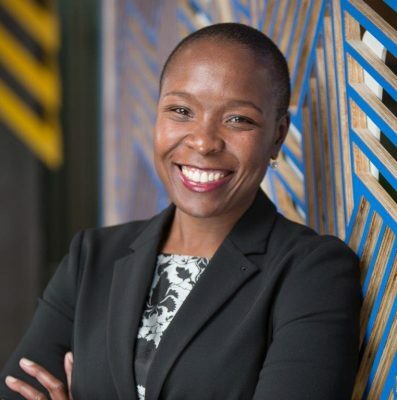 Holding B Com, LLB Laws and MBA degrees, Sithole practiced law as an attorney at Webber Wentzel specialising in labour law, litigation and conveyancing before joining Transnet. After taking on several executive positions at the company, Sithole was announced as CEO. Her emphasis on strong work ethics, teamwork, accountability, speed of delivery and quality define a leadership style that will seek to solve many of the economy’s challenges.